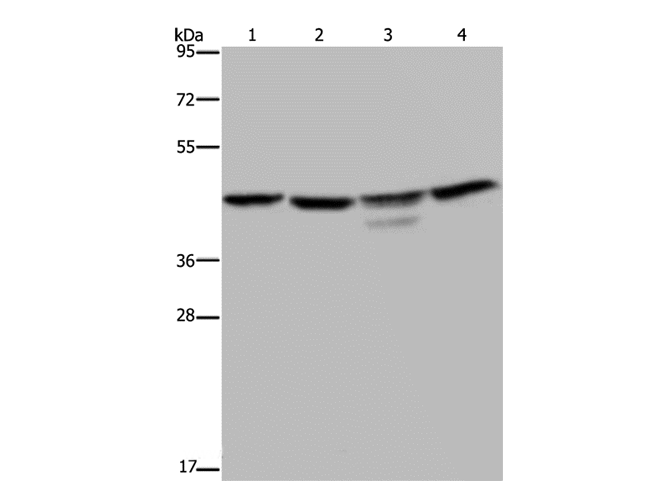 Small volumes of anti-CSNK2A1 antibody vial(s) may occasionally become entrapped in the seal of the product vial during shipment and storage. If necessary, briefly centrifuge the vial on a tabletop centrifuge to dislodge any liquid in the container`s cap. Certain products may require to ship with dry ice and additional dry ice fee may apply. Casein kinase II is a serine/threonine protein kinase that phosphorylates acidic proteins such as casein. It is involved in various cellular processes, including cell cycle control, apoptosis, and circadian rhythms. The kinase exists as a tetramer and is composed of an alpha, an alpha-prime, and two beta subunits. The alpha subunits contain the catalytic activity while the beta subunits undergo autophosphorylation. The protein encoded by this gene represents the alpha subunit. While this gene is found on chromosome 20, a related transcribed pseudogene is found on chromosome 11. Three transcript variants encoding two different proteins have been found for this gene. NCBI/Uniprot data below describe general gene information for CSNK2A1. It may not necessarily be applicable to this product. CK2A1: an ubiquitous protein kinase of the CK2 family. Exists as a tetramer composed of two catalytic subunits, alpha and alpha-prime, and two regulatory beta subunits. The beta subunits undergo autophosphorylation. The isoforms are rarely specified in publications. Two splice variant isoforms have been found. Participates in Wnt signaling. Phosphorylates E2 ubiquitin conjugating enzyme UBC3B inducing its interaction with beta-TRCp and enhancing beta-catenin degradation. May control IkB-alpha and p27Kip1 degradation. component of a CK2-SPT16-SSRP1 complex composed of SSRP1, PT16 CK2-A1, CK2-A2 and CK2-B the complex associating following UV irradiation. Interacts with RNPS1. Mouse transgene causes mammary gland hyperplasia and lymphoma, and activation by bovine parasites leads to fatal lymphoproliferation. Expression and activity are elevated in lung tumors and breast tumors. 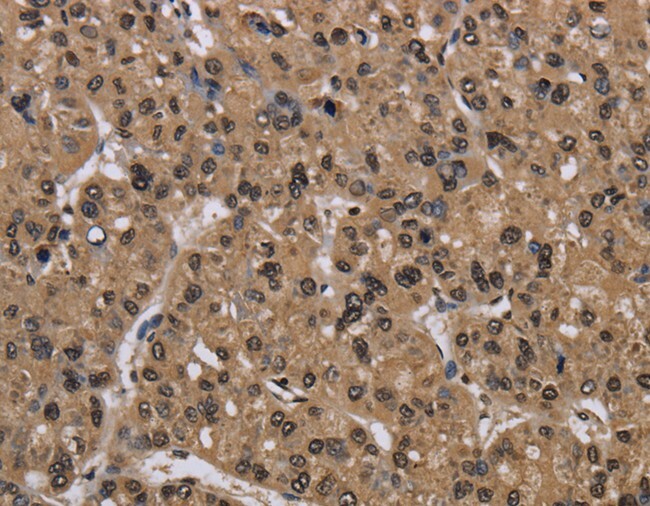 Antisense drives apoptosis of tumor cell lines and xenografts. Involved in DNA break repair by phosphorylation of scaffold protein XRCC1, phosphorylation of BRCA1, and phosphorylation of p53 in response to UV irradiation. Drosophila CK2 (Timekeeper) is involved in circadian regulation. Phosphorylates and binds to a major component of the inclusion bodies seen in Parkinson?s patients. Inhibitors: 4,5,6,7-tetrabromobenzotriazole (TBB). 1. the inhibition of protein kinase CK2 transiently inhibits cell proliferation through the induction of G1 cell cycle arrest and attenuation of protein synthesis by phosphorylating eIF2 alpha.